This article was originally published by Global Research in November 2017. Although heavy loss of young lives in the stalemated land war on French territory dissipated national strength and morale, Britain’s fate, ominous for a certain period of time, was dependent on the development of the war on the high seas. This was not related to a diminution in the formidable power of Britain’s navy which had imperiously ruled the waves since the time of Lord Nelson’s victory. A defeat at the Battle of Coronel off the coast of Chile in November 1914 had been swiftly revenged the following month in the Battle of the Falklands. And while the German High Seas Fleet inflicted heavy losses on the Royal Navy in the epic Battle of Jutland in 1916, the result was essentially a draw, after which the German Navy did not venture out of its ports on the Baltic Sea to confront the British. The problem at sea related to German U-Boat warfare which was inflicting colossal losses on British cargo. An Island nation could only sustain so much before capitulating. This was the warning delivered in 1917 by the British Admiralty to its political overlords. America’s resources of manpower and martial machinery was needed to tip the balance. But just as would be the prelude to US intervention in the Second World War, the Americans, for long heeding of the advice given by their Founding Fathers, were wary of getting into “foreign entanglements”. This is where the leaders of world Zionism came in. It was a simple bargain: If Jewish leaders such as Chaim Weizmann could call on the Jewish Diaspora in America to use their influence to bring the United States into the war to rescue a desperate situation, then Britain would do what it could to help bring to fruition the Zionist dream of a Jewish state in Palestine. The ‘Balfour Declaration’ was part of this bargain. It is a delusion to suppose this was a mere act of crusading enthusiasm or quixotic philanthropy. On the contrary, it was a measure taken. . .in due need of the war with the object of promoting the general victory of the Allies, for which we expected and received valued and important assistance. It has been repeatedly acknowledged by British Statesmen that it was the Jews who, in the last war, effectively helped to tip the scales in America in favour of Great Britain. They are keen to do it – and may do it – again. 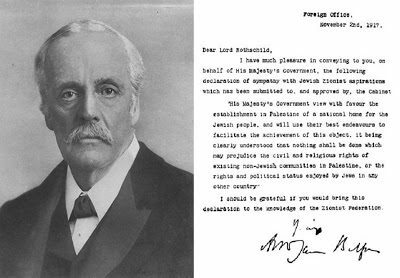 The Balfour Declaration was one of several bargains entered into by Zionists en route to the eventual declaration of the State of Israel in 1948. Another would be the controversial Haavara Agreement [or ‘Transfer Agreement’] with Nazi Germany entered into by German Zionists in the 1930s. Before Israel was born would be the struggle of the Palestine-based Jewish Agency to get Britain, the holders of the Mandate, to allow unrestricted Jewish immigration to Palestine, the bombings and assassinations conducted by Irgun and Lehi against British and Arab targets, the United Nations Partition Plan and a war against Arab armies. Today the Armenians bemoan the ‘betrayal’ of the Western powers for not enabling the creation of an Armenian nation spanning much of its historical territory, and the Kurds similarly feel ‘betrayed’ by the unfulfilled promise of a homeland made by the 1920 Treaty of Sevres. But few are aware that a Jewish homeland -the Jewish Autonomous Oblast- was created in the USSR under the watch of Joseph Stalin in 1934 with Birobidzhan as its administrative capital. It still exists, albeit with a rather minute Jewish population. Meanwhile, Israel is approaching its seventieth year of statehood. The Balfour Declaration put into the public imagination the idea of a Jewish state which twenty years earlier, Theodor Herzl, wary of ridicule, was content to write of in his diary after the Basel Congress. That the Arabs of Palestine, tied for centuries to the hamlets, towns and cities on the land Zionists refer to as Eretz Yisrael, have been subjected to dispossession and occupation while been continually denied a state of their own is surely evidence that Balfour’s condition has not been met. The Jews created a nation in Palestine, but that created an inevitable injustice against its Arab Muslim and Christian inhabitants.